Guys! Look at me updating on the regular! See? I DO keep New Years Resolutions! Please don’t look in my cheese drawer! I posted a story on the old ‘gram last night and got a flurry of comments asking me for the recipe, so I’m going to share it with you today to show you that I do listen to you and care enough to keep your life nice and delicious. I’ve got a real thing for saucy chicken over fluffy, salty coconut rice, and I probably cook something to that effect at least twice a week, but this sauce in particular was a real thing of beauty. Also, as previous sentence suggests, I kind of need to lay off the rice, so I made cauliflower rice instead, which is quite delightful and makes you hate yourself less for eating that entire bag of Tostitos. Plus it takes less time than making real rice, so we’re winning on all fronts, here. And AND! Cauliflower is a vegetable, so no need to make a side of veg to go with this dinner if you just don’t have the energy (hi, that’s me). A further bonus is grocery stores have started carrying cauliflower “rice” (uncooked and chopped fine) in the produce section, so have a look for that if you don’t feel like dragging the food processor out. If you can’t find it at the store, no big deal. Drag that gal out (my food processor is female? ), cut off all the florets from the cauliflower, discarding the stem, and pulse in the processor until fine. It’s still easy, it just take more sweet, precious time. In a large bowl, mix the Chinese 5 spice powder, the allspice, onion powder, red pepper flakes, salt and pepper. Coat the chicken thighs in the spice rub. In another bowl, mix the soy sauce, honey, sambal, ginger, and garlic. Heat a large oven safe pan over high heat. Add the olive oil and sear the chicken thighs, skin side down, for about 5 minutes until a deep golden brown. Flip over and cook another couple of minutes. 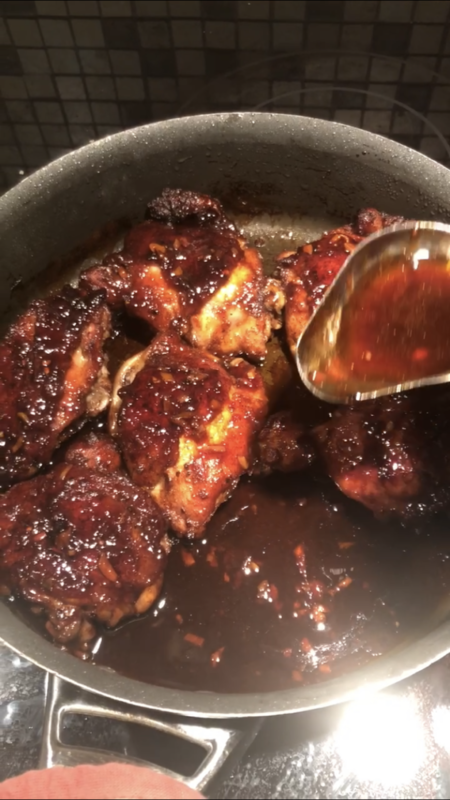 Pour the glaze over the top and turn the chicken thighs in the glaze as it comes up to a bubble, about 2 minutes. Leave the chicken skin side down and transfer the whole thing to the oven. Cook for another 25 minutes, turning halfway through, and basting the glaze over the top every once in awhile. When the chicken has about 10 minutes left, heat a pan over medium-high. Add the olive oil, and the cauliflower. Season well with salt and pepper. After about 4 minutes, add the garlic and sauté 2 more minutes. Add the coconut milk, tossing the cauliflower to coat for another 4 or so minutes. Sprinkle with the cilantro. Serve the chicken over the rice with a little extra glaze spooned over the top. OMG! nooooo! oh no! keep the stem. peel and pickle… have a great weekend! Simple, straight forward, honest-to-Josh food… Looks Yummy! Right when are you available to come round and make this? I’m free most evening so just let me know. P.s I live in Scotland that’s not a problem is it? As one working parent to another, I want to suggest the Ottolenghi SIMPLE cookbook. Amazing food and fast, simple recipes. I used to follow your blog soooo long ago, and made a risotto recipe of yours, which is what lead me to having risotto as our traditional Christmas Eve dinner every year! That’s how good it was! Sorry I’ve been away so long, but I’m back on the blog train. P.S. You’ll always have a special place in my heart as 10 years ago we named our German Shepherd after your character on Firefly. Kaylee is made of sweetness and light and no power in the ‘verse can stop her being cheerful. True of your character and our wonderful dog.